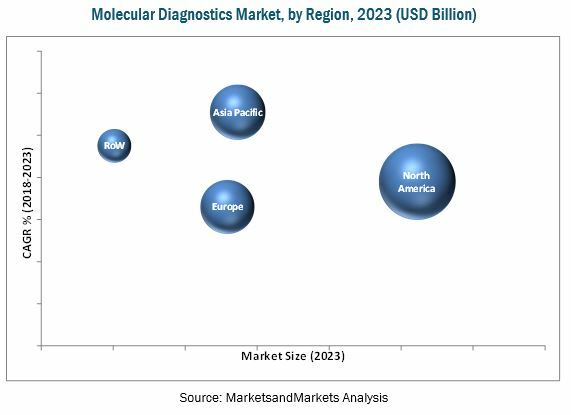 [241 Pages Report] The molecular diagnostics market is projected to reach USD 11.54 Billion by 2023 from USD 7.10 Billion in 2017, at a CAGR of 8.4%. The base year considered for the study is 2017, and the forecast for the market size is provided for the period between 2018 and 2023. Growth in this market is primarily driven by the high prevalence of infectious diseases and various types of cancers, increasing awareness and acceptance of personalized medicine and companion diagnostics, growth in the biomarker identification market, and advancements in molecular techniques. Both, top-down and bottom-up approaches were used to validate the size of the global molecular diagnostics market and estimate the size of various other dependent submarkets. Major players in the market were identified through secondary research, and their market presence was studied through primary and secondary research. Secondary sources include annual reports, press releases, and investor presentations of companies; white papers; medical journals; certified publications; articles from recognized authors; gold standard and silver standard websites; directories; and databases. Primary research included extensive interviews with key opinion leaders such as CEOs, vice presidents, directors, marketing executives, and related key executives from various companies. The percentage splits, shares, and breakdowns of the segments were determined using secondary sources and verified through primary sources. This data is consolidated and added with detailed inputs and analysis from MarketsandMarkets and presented in this report. The key players in the global market are Roche (Switzerland), Hologic (US), QIAGEN (Netherlands), Abbott (US), and Danaher (US). The global molecular diagnostics market is projected to reach USD 11.54 Billion by 2023 from USD 7.71 Billion in 2018, at CAGR of 8.4%. Molecular diagnostics is a technique used to identify and analyze nucleic acids or proteins at a molecular level. This technique assesses the genetic makeup of an individual to identify predisposition to a particular disease or condition and diagnose it. Growth in this market is largely driven by the high prevalence of infectious diseases and various types of cancers, increasing awareness and acceptance of personalized medicine and companion diagnostics, growth in the biomarker identification market, and advancements in molecular techniques. On the other hand, the presence of complex regulatory frameworks for the approval of molecular diagnostic tests is one of the major factors restraining the growth of this market. In this report, the market has been segmented on the basis of product and service, application, technology, end user, and region. On the basis of product and service, the market is broadly segmented into reagents and kits, instruments, and services and software. The reagents and kits segment is expected to account for the largest share of the global market in 2018 and is projected to register the highest CAGR during the forecast period. The availability of a wide range of reagents and kits, rising use of reagents and kits in different therapeutic areas (such as infectious diseases and oncology), increase in basic research and commercial applications, and easy accessibility to a wide range of reagents are expected to drive the market for molecular diagnostic reagents and kits in the coming years. Based on application, the market is segmented into infectious diseases, oncology, genetic tests, and other applications. The infectious diseases segment is expected to account for the largest share of the global market in 2018. The large share of this segment can be attributed to the development of advanced assays for different diseases and conditions, significant increase in the prevalence of infectious diseases, and rising awareness about the effective use of molecular diagnostic technologies or products to control the occurrence and spread of infectious diseases. Based on technology, the market is segmented into PCR, INAAT, DNA sequencing & NGS, in situ hybridization, DNA microarrays, and other technologies. In 2018, the PCR segment is expected to account for the largest share of the global market. The large share of this segment can be attributed to the growing use of PCR in proteomics and genomics, automation of PCR instruments, and the emergence of advanced technologies like qRT-PCR. On the basis of end user, the market is segmented into hospitals and academic laboratories, reference laboratories, and other end users. In 2018, the hospitals and academic laboratories segment is expected to account for the largest share of the global market. The large share of this segment can primarily be attributed to the large number of diagnostic tests conducted in hospitals. In 2018, North America is expected to account for the largest share of the global molecular diagnostics market. The large share of this region can be attributed to factors such as the high prevalence of infectious diseases and cancers in the region, presence of a highly developed healthcare system and large number of leading national clinical laboratories, easy accessibility to technologically advanced instruments, availability of government funds, and growing applications of molecular diagnostics in genetic disorders and cancer screening. The key players in the global market are Roche (Switzerland), Hologic (US), QIAGEN (Netherlands), Abbott (US), and Danaher (US). These players focus on inorganic strategies such as acquisitions, partnerships, agreements, and collaborations as well as organic strategies such as expansions and product launches & approvals to sustain their positions in the market.